Interviewed at the Marconi Center in South Philadelphia, these two Italian-American men recount their early experiences with education and work life. Giovanelli emigrated with his family from Naples in 1918, working at Hog Island Shipyard during World War I and eventually retiring from a career at General Electric as a mechanical designer. Di Sipio was born to immigrant parents in South Philadelphia, where he grew up with nine children in a three-room house. At the time of the interview, both men were actively involved in the community life of the Marconi Center, a program for older adults, and in Saint Monica’s Catholic Parish. Irish Americans--Social life and customs. 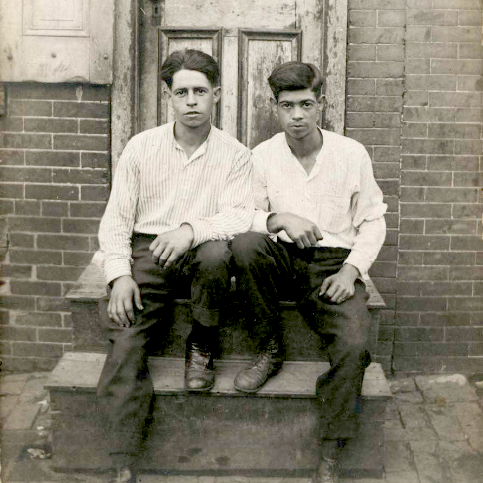 “Michael Giovanelli & Frank Di Sipio,” Philly Immigration, accessed April 19, 2019, http://phillyimmigration.nunncenter.net/items/show/831. This project is a collaboration between West Chester University faculty and students in HIS 480/HON 451, Spring 2018 and the Louie B. Nunn Center for Oral History at the University of Kentucky Libraries.